Congratulations to two of our year 6 pupils who won an additional prize in the Rotary Clubs photographic competition. Earlier on in the year both girls won 1st and 2nd prize in the local competition. Their winning entries were then entered into the district competition which covers Merseyside and North Wales. Lauren's photograph was awarded 1st prize and Soraya's photograph was 'highly commended. 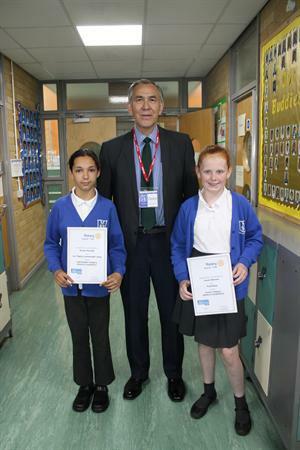 Lauren and Soraya are pictured with Ray Wong from Garston Rotary Club who awarded their winning certificates. Well done to both girls!